Does anyone know why the DTW-FRA-DTW flight has recently been being switched from 767-300ER to A350-900 and by the same token DTW-AMS-DTW has been having the 767-300ER fly that route? Is there a thought that the A350 is needed to compete better against LH where as DTW-AMS-DTW has less competition? This week was press week for the North American International Auto Show. Although fewer German brands were participating this year, it's still a major draw and provided Delta a prime opportunity to upgauge the route and feature their latest products. It could also be related to the cancelled flights earlier in the week. Perhaps Delta is trying to add capacity for affected travelers. I could see that if they were unscheduled swaps, but these were scheduled swaps which means they've been planned for a while. Correct. These were loaded last year so definitely related to the Auto Show. Thank you that makes a lot of sense. Similar to how DL swapped some flights and added additional flights into LAS with the A350-900 for the CES in Vegas. Or, just provide more coach and Y+ seats. DL isn't going to get German auto suppliers (Bosch, Continental, ZF, BASF, Schaeffler...) out of their LH contracts. 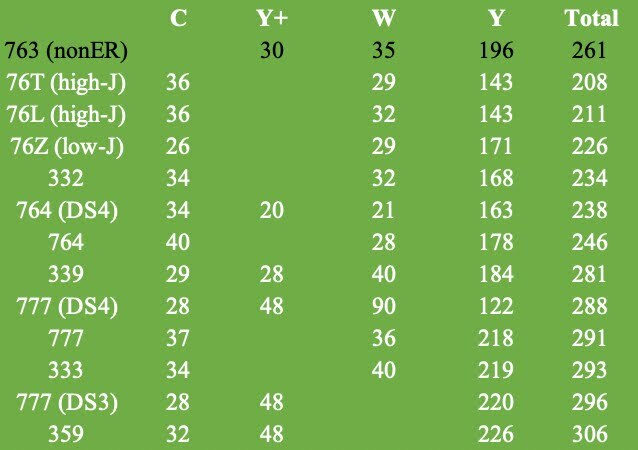 As we hit the lull in the winter schedule, I've put together a few tables summarizing DL's widebody fleet usage for W18-19. The tables should look very different next year with the addition of the 339 fleet as well as the 4 Class Delta Suites 777/764s. 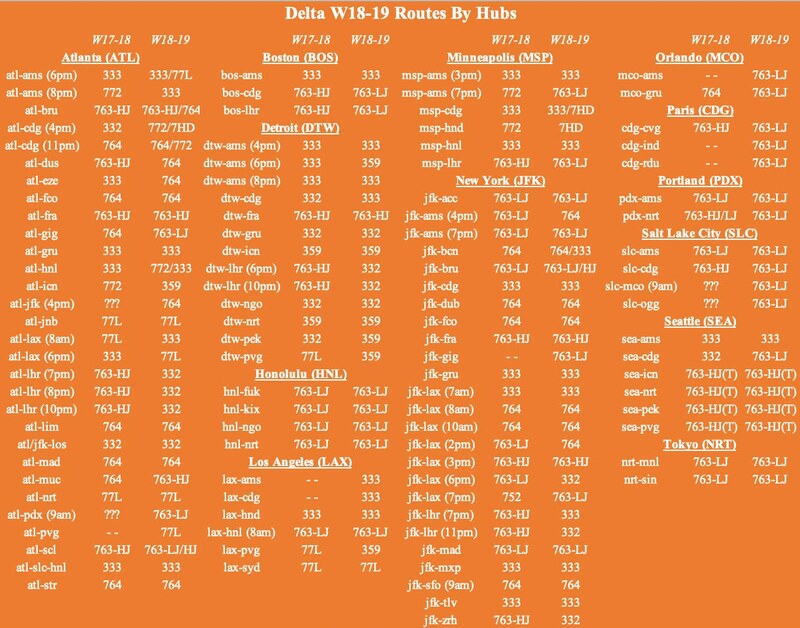 Delta has released a preliminary W19-20 schedule. Nothing worthy of mention so far. Didn’t DL operate an A333 MSP-CUN last winter? The BOTTOM LINE.... no 787, 77W, and now NOMORE 350 back to 333. So is the 777 the FLAGSHIP? Huh? I swear there’s more and more incoherent babble on here every day. How is the A350 no more? Yes they did. Although not regularly throughout the Winter scheduled. What about SLC to HNL? Flight Aware shows that as an A330. its in both tables. 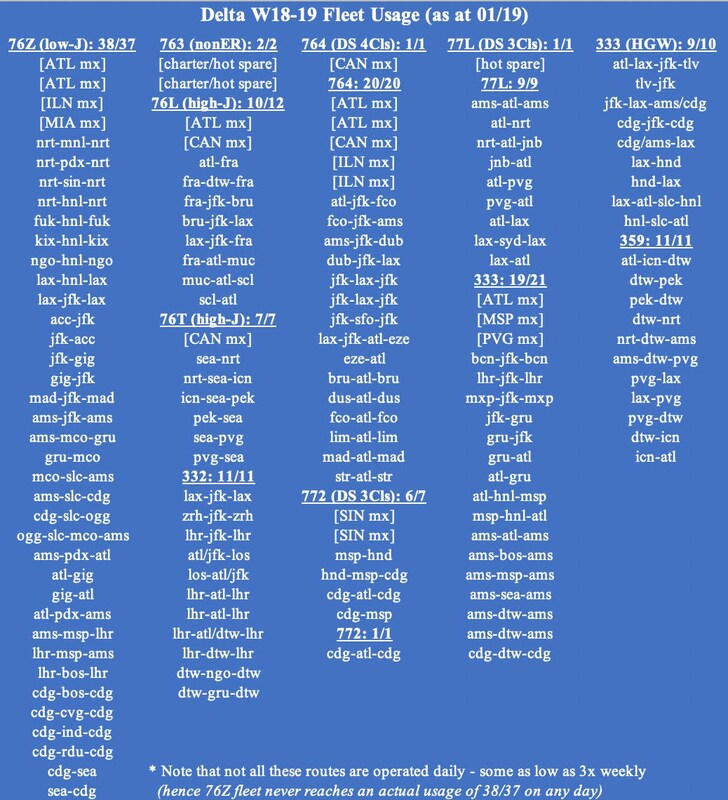 the routing is actually ATL-SLC-HNL. I see it now hkcanadaexpat. I was looking for it under SLC. Thank you for your work, I always enjoy the data and updates! Yep! This year seems to be all A321's for CUN. Can anyone explain what this upgrade was about? I would have figured it would have just done 1 leg ATL-BOS to then go on to Europe from BOS but what is the reason for sending the A330-300 up to boston and then back to Atlanta? I am guessing the A321 went tech and the A330-300 was the best match that was available as a spare? It might also be due to the WX-related issues in Boston over the last few days that have led to significant delays and cancellations. Remember when this was a paysite? Coherent, factual and simply brilliant discussions on every topic. To PotatoPappas - What you wrote wasnt even a sentence, please elaborate? Looks like N504DN is subbing for another aircraft on flight 1239 Detroit-Atlanta to fly to Seoul later tonight. Guess the inbound from Seoul went tech or something. Elaborating... The people that post "incoherent babble" is who I'm talking about. I'm saying I ignore them.. (I don't give them the time of day anymore). Its not worth giving them the attention. [quote="hkcanadaexpat"]As we hit the lull in the winter schedule, I've put together a few tables summarizing DL's widebody fleet usage for W18-19. You are the F***ing MAN! Thank you for your contributions sir and for keeping this going on your spare time!! The UAL Thread is a mile long, but I really look forward to this Thread. Thank you again my friend! N512DN, the next A359, is scheduled for delivery to ATL on Saturday morning. Slack is not an issue in the lull of winter. Refurbishment/maintenance stations are the issue and need to be booked long in advance. For this winter, DL has booked 2 stations in SIN to do 777 mods, 4 in CAN that are doing heavy maintenance as well as the prototype 764 mod, 1 in PVG doing heavy maintenance and new to this year ILN/MIA stations also doing heavy maintenance. Until May arrives, you can expect to see 777s with mods roll out SIN every ~30 days. Come the Fall of 2019, SIN will continue with the remaining 77Ls and 4x CAN stations will work full time on the 764 mods. If the first route for Delta’s A330-900neo is going to be SEA-Asia, which route will it be? With the exception of SEA-NRT switching to an Airbus A350-900 soon, and the return of SEA-KIX using a 226-seat Boeing 767-300ER, just about every route Delta has from SEA-Asia uses a 206-seat Boeing 767-300ER. Unless those flights constantly fill up constantly and need more capacity, I don’t see why those routes would need a 281-seat Airbus A330-900neo. If Delta really wants to send the A330-900neo to Asia, they should pick a route like LAX-HND, which uses a 293-seat A330-300. A plane with a much more similar capacity to the A339 than the B763. Should start seeing extra sections with A330s on the ATL-AMS routes until further notice, as they are covering for KLM and an apparent shortage of planes. How is this working if you were booked on KLM going AMS-ATL will you be swapped over to the extra DL A330 flight? I thought the Suites were supposed to become standard across Delta’s entire widebody fleet by the end of 2021. Then again, the 763s will not be around long term. Ed Bastian said in an interview during the summer that the entire international fleet will receive the suite product (though someone here said there may be a very similar version without a door for the 767). The 763 may not be here long term but Delta relies so heavily on the 763 fleet (with a Delta One product that is inferior to the rest of the Delta fleet), I don't think they have a choice but to replace the seats. The current Delta 767 business class seat is simply not competitive to UAs 787/777/767 or AAs 787/777 seat, which will drag down the perception of the entire Delta One product. If the 767s end up being replaced by the 797, the majority will be around well after 2025. Too bad DL ended up cancelling NW's order for the B788s! They should've just postponed the order until the battery issues were fixed, and then proceeded with the deliveries which would now be ready for the D1 Suites! They picked the A330neo instead of the B787 and orders begin delivering this year. They had no need for the 787 order. Maybe not for that particular 787 order, but they really do need the 787. It would be much better for their Asia routes out of their SEA, LAX, SLC and even MSP hubs. The A330neo has too much capacity for a lot of those routes and isn't quite as efficient. Not that the A330neo doesn't have a place in the fleet, it's great for their hub to hub TATL markets. However, if I were DL, I'd replace the remaining 767's with 788's and the NMA/797. Maybe Delta should have ordered the 338 instead of the 339 for the West Coast to Asia routes. A 338 should be able to do almost everything a 788 can. There is potentially more to this story. Unconfirmed so take it with a grain of salt until you hear otherwise.